Response: Our goal today is to recognize melanoma at the earliest stage, ideally before it invades the dermis and acquires metastatic potential. 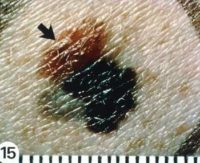 Melanoma-specific dermoscopic criteria have been tested mainly in the context of invasive melanoma. Although they were proven valid melanoma predictors, the question still remains if they are strong enough to diagnose melanoma in situ (MIS). Our aim was to investigate the diagnostic accuracy of dermoscopic criteria for the diagnosis of melanoma in situ. We identified 5 main positive dermoscopic indicators of MIS: atypical network, regression, irregular hyperpigmented areas, prominent skin markings and angulated lines. Response: Readers should consider all the aforementioned dermoscopic indicators for the diagnosis of MIS. Two of the five predictors proposed above are firstly introduced by the present study, namely irregular hyperpigmented areas and prominent skin markings. Interestingly, when melanoma was compared only with atypical nevi, only these two remained predictors for melanoma in situ. Taking into account that atypical nevi represent the most challenging group of tumors to differentiate from MIS, clinicians should pay special attention to these new criteria. Response: Further studies on melanoma in situ need to be performed in order to verify our results and to validate the reproducibility and the usefulness of the new criteria. Response: There is no doubt that dermoscopy improves our ability to differentiate melanoma fro other skin tumors. In fact, our study shows that dermoscopy allows the recognition of melanoma at the earliest possible stage, when it is still restricted within the epidermis. However, clinicians should always remember that dermoscopy is only one piece in the puzzle of clinical diagnosis. Dermoscopic findings should always be interpreted within the overall clinical context of a given patient and combined with macroscopic morphology and patient’s characteristics, such as age and known risk factors for melanoma. This entry was posted in Author Interviews, Dermatology, JAMA, Melanoma and tagged dermoscopy, melanoma by Marie Benz MD FAAD. Bookmark the permalink.